If you’re feeling the rising cost of energy in your bank account, we understand, and you’re not alone. People across California are searching for an alternative to traditional energy sources to save money, cut bills, and, hopefully, save the environment along the way. 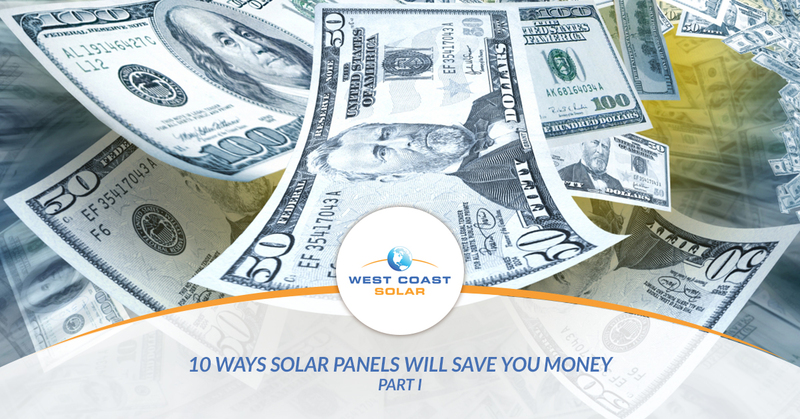 West Coast Solar wants to share with you 10 ways solar panels will save you money once you switch to solar energy. The initial cost of solar design and installation are a common concern for most considering the switch to solar energy. However, the environmental benefits of renewable energy paired with the reduction of energy cost to you over the long-term are hard to beat. The federal government is aware of both benefits, and they offer a number of incentives to lessen the initial investment into solar like the Solar Investment Tax Credit (ITC), a federal program that offers up to a 30 percent tax credit to those who’ve invested, designed, and installed solar on their residential or commercial property. When you install solar panels on your home or business, you reduce your dependency on traditional power sources. This means that your solar energy system will generate a percentage of power, removing your need to pay high electricity costs every month to your energy provider. Not only does this save you money, but you also help reduce carbon emissions. You may be able to negotiate lower rates with your energy service provider, if you switch to solar energy, based on your lessened energy consumption. Due to your system producing a percentage of your power, if not all of your power, you won’t be relying on the energy service provider for energy, which means you could give them a call and negotiate lower rates, saving you money. The government induced the Renewable Feed-In Tariff (FIT) Program to promote the use of renewable energy. Those who produce power through wind, hydro, solar, or otherwise are encouraged to sell their excess energy to the local energy provider. This means if your home or business is producing more energy that it uses, you may have the opportunity to sell your power to your energy service provider, which means you’re making money off the grid. You have a unique opportunity when it comes to making the switch to solar energy. Solar companies offer lease agreements to homeowners so the homeowner may purchase energy at a predetermined rate from the solar company. The solar company, then, installs solar panels on the homeowner’s roof to generate the energy they’re selling to the homeowner, which is typically less than what the homeowner would pay to their traditional energy service provider. Not only do you save money without having to invest in the installation of the solar power system, but you save money by paying less than what you would owe for traditionally produced energy. Want to save money with your energy expenses? Want to make the switch to solar energy? West Coast Solar has been serving Sacramento, San Jose, and the surrounding areas for years. We know what it takes to design and install the best solar panels in the industry. We also understand the decision you’re pondering to use renewable energy instead of traditional energy. So if you’re still unsure how solar panels can save you money, read part two of this blog series. Otherwise, give us a call today, and let’s get started on your solar energy project!